I'm not a big fan of conspiracy theories. Maybe I'm just in denial, but most of them don't seem very plausible to me. I do, however, enjoy a good mystery, and suspense thrillers. Author Ellen Butler has managed the best of all three genres with the second book of the Karina Cardinal Mystery series, a story which stands on its own even if this is your first introduction to the feisty heroine. Karina is a lobbyist in Washington D.C., so it comes as no surprise that Fatal Legislation has definite political overtones. As the sole witness to the death of Senator George Harper, from what seems to be a heart attack, the young woman gets dragged into a quest to discover just what is going on behind the shady Washington corridors of power. With the help of her FBI boyfriend Mike, along with a trio of security agents from Silverthorne Security, Karina slowly begins to unravel a conspiracy bigger than anything she could have possible imagined. 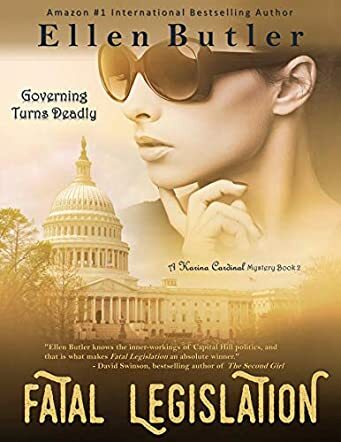 What makes Fatal Legislation work best is the way author Ellen Butler masterfully manipulates her characters in a realistic, thought-provoking story that could have easily have spun out of control in the hands of a less gifted storyteller. The action sequences will keep you on the edge of your seat, while the secret behind what's really going on will keep you guessing until the end. Through it all, Karina comes across as a real person, not some cardboard cut-out of what we expect from somebody in her position. She's a bit more headstrong than most of us perhaps, but that's what makes this type of adventure so entertaining. And entertaining it is, from the moment Senator Harper drops dead – literally at Karina's feet – until the closing pages of this tightly paced story.